Five months into the year and the Earth is tilting its head more towards the Sun (something I try to avoid) and the days are getting longer. In fact the Sun doesn’t set until nine o’clock for most of the month, so darkness has to wait till nearly ten. As the sky starts to darken, though, something appears in the sky even while it’s still relatively light. Look just to the left of south and not quite halfway up the sky, and Jupiter is clearly visible. As the minutes pass by, it appears brighter and brighter till by the time it is properly dark, it dominates the sky. When you have got the hang of where it is in the sky, you can impress your friends by pointing it out in the early twilight (my pals always happily roll their eyes around the heavens when I do this!). A really bright waxing gibbous Moon is close by on the 7th, with full moon being on the 10th. Incidentally, there is something special about this full Moon; observe it and see if you can tell what it is. Jupiter is, of course, the biggest planet in our Solar System – but just how big? Well, a modern jet airliner would take about 47 hours to fly around the world (if it could) but the same aircraft would take more than 20 days to circle Jupiter. Jupiter is sitting in amongst some bright stars at the moment, so let’s identify some of those. Just below and to the left is Spica, the brightest star in Virgo. Look for a small line of faint stars just above Jupiter for more of this constellation. Further away to the right and higher is Regulus in Leo. A very familiar constellation, easy to make out because it does look like a lion. At the same elevation to the left of Jupiter is the brightest star in the sky, Arcturus. This is a very odd star because although it is about 26 times as big as our Sun, it is only about twice the mass. It is also plummeting through our galaxy at about one hundred miles per second! It probably doesn’t even belong to the Milky Way and is, literally, just passing through. 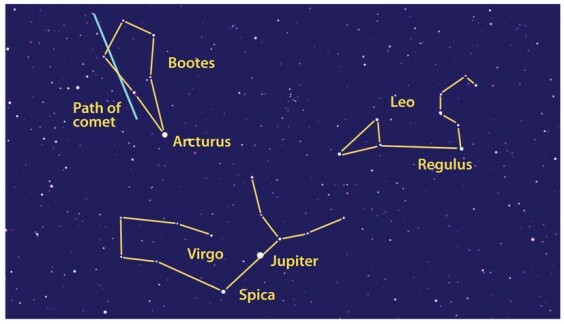 Up above Arcturus, you should be able to make out the kite-shaped constellation of Bootes to which it belongs. It doesn’t really look much like the herdsman it represents but perhaps he enjoyed a spot of kite-flying on his days off. Behind Bootes is an enormous hole in space. This is a patch of the universe which seems to be totally empty, called the Bootes Void. Look deep into space in any direction (with a really big telescope) and you can see galaxies, but not here. It’s no good looking for it, though; there’s nothing to see! During the course of the month, a comet slides down the left-hand side of Bootes. This is comet C2015 V2 Johnson, not the brightest comet but it should become visible with binoculars. Worth keeping an eye on.